Since 2005 we have been working with auto-stacking sod harvesters. The TREBRO SC2010 is the third generation of auto-stackers at our company and our experience is that this machine meets all our needs. We harvest more turf in less hours. So we save fuel and labour costs. We spend less money on harvesting blades and we do not need expensive pallets. The SC 2010 is a very reliable machine with minimal breakdowns. 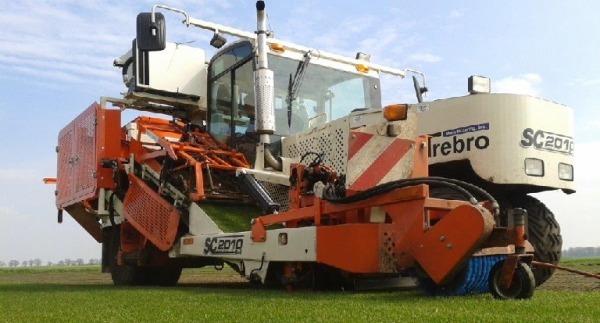 The TREBRO SC 2010 has a good maneuverability and the driver sits in a comfortable cabin with a good view of the workings of the machine. Bad rolls can be simply removed with the push of a button. The transition from the usual 40 cm wide rolls (16”) to the current 58 cm (23”) wide rolls was not a problem for our customers. The wide rolls are laid faster than the smaller ones and have fewer seams.